He hasn’t scored a touchdown yet, but he had fans cheering him on whenever he got the ball. Vern Hee/ Pahrump Valley Times Sophomore linebacker Anthony Peralta heals up from a game-related injury while watching his teammates practice on Monday. He said he should be back on the field for the upcoming game against Chaparral. 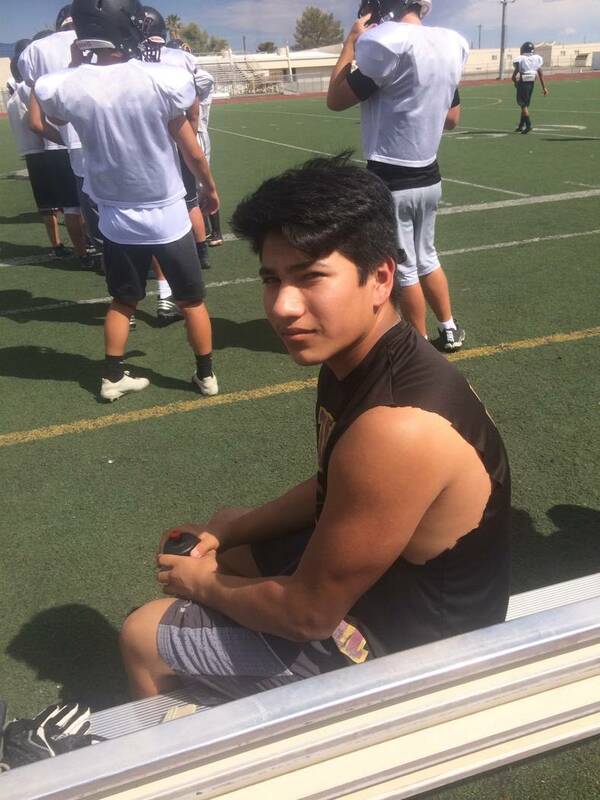 Sophomore Anthony Peralta made the Pahrump Valley High School varsity football team this year and made an impression in his last game. He made the team as a linebacker this year, but in last week’s game when junior running back Nico Velazquez went down with an injury, Peralta stepped in and made some yards as a running back. Peralta’s love for football goes back to when he was in grade school. His favorite position is linebacker. He said he was a bit nervous starting his first varsity game. “It took me a whole quarter before I settled down,” he said. Being a defensive player requires him to study the offensive line and its movements. Peralta said he is still learning to read the guards (linemen). Peralta said the Pahrump defense didn’t slow down in the second half of last week’s game. His main goals for his first varsity year are to keep starting on the varsity team and then he plans on going to college and maybe playing football too. He acknowledged that his family supports his football. “My parents are my biggest fans and they have supported me since I was six,” he said. His mother, Marlina Calleros, is his number one fan.